If you're looking for all-inclusive resorts in the Caribbean that include two vacations in one––an an elegant British Colonial estate and an exotic offshore island––Sandals Royal Caribbean is for you. Photo copyright Sandals Beaches Resorts. 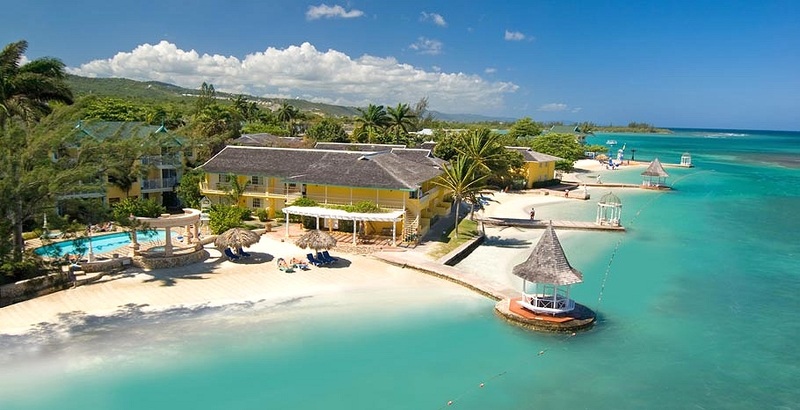 As Jamaica's most alluring retreat, Sandals Royal Caribbean takes you to opposite sides of the world from its regal British Manor – and mannerisms – to the mysterious Orient on a private offshore island minutes from the resort. Set along a pristine ribbon of beach in Montego Bay, the Jamaican resort's elegant British accent begins with a proper arrival through a grand port cochere to a noble Georgian-style Great House surrounded by tropical gardens. This is where the highbrow side of you will enjoy continental breakfast in bed and afternoon tea. Minutes away, an authentic dragon boat will shanghai you to a private offshore island hosting endless exotic adventures: both poolside & beachside pleasures by day, chic parties and bonfires at night, and an authentic Indonesian restaurant. Dining offers endless reinvention at six additional restaurants back on shore. If you would like to swim up to your own private patio, check into a Swim-Up Suite that also includes the envied advantage of personal butler service. High tea to exotic Thai in old world Jamaica… Sandals Royal Caribbean gives you several exotic vacations for the price of one.